I recently thrifted a lovely piece of fine cotton-like fabric from my local Salvation Army store -- I couldn't resist the fun print! It is very lightweight but full of colour in its blue and yellow and coral paisleys. I considered for a while, trying to decide which pattern it would suit. 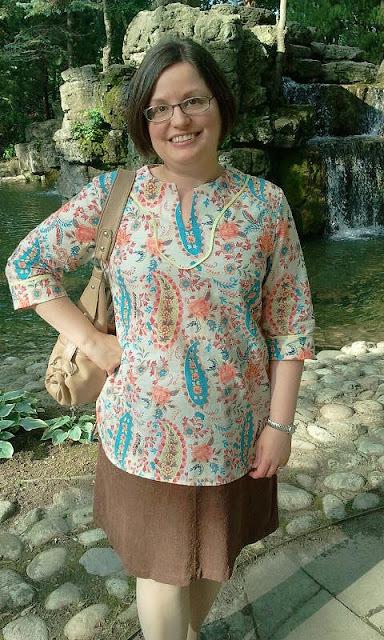 I really wanted a tunic in this print. I chose KwikSew 3601 because I thought the fabric would work well with its straight lines. 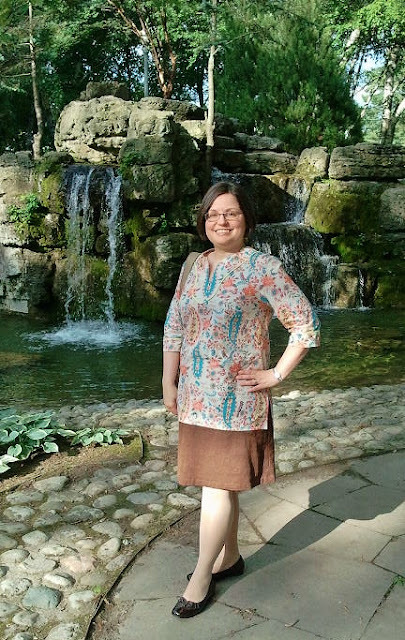 (I also have McCalls 7128 but I wasn't sure this fabric, though lightweight, would gather nicely -- it doesn't have a lot of drape) I was inspired by Mhoutz' PatternReview make, all in one fabric with piping delineating the different parts of the top. just before my husband swatted a mosquito on my forehead! I cut it and then dithered for a while because I couldn't find the right shade of blue piping to match -- I was fixated on blue. 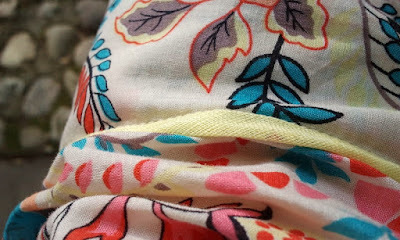 But then one evening I picked up my shoebox of vintage trims (one I picked up at a church sale for $1 for the whole box) and found an unopened package of yellow percale bias tape in the exact tone of yellow in this print. 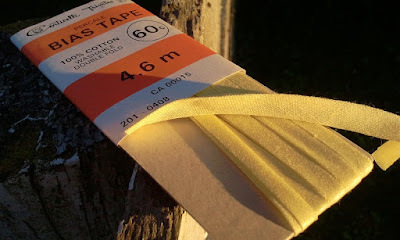 This bias tape is completely different from any of the modern cotton ones I've ever bought -- it's a fine, light weave, the perfect match for my fabric. I used it as flat piping, attaching it to the edges of the neck and sleeve facings first, and then stitching them as directed, leaving the folded edge of the binding free. I thought that would give it a little more dimension, rather than stitching down the outer edge of the yellow strip. I'm a little annoyed that it isn't quite even around the bottom of the neck facing, but only I would probably notice that -- well, either me or other sewing friends ;) One interesting thing I found with this vintage bias binding is that it was unevenly folded in parts, and I had to cut off a few inches because it just wasn't re-ironable to sufficient evenness. Good thing there was so much of it! As to the pattern itself -- as per KwikSew generally, it was very clear indeed, with great illustrations and a very simple design. It was very easy to cut this one out, even with my care to cut the neck facing to echo the placement of the front bodice so that instead of the neck having other shapes shadowing through, it would lie on top of the same part of the print and make it more intense, as much as possible. 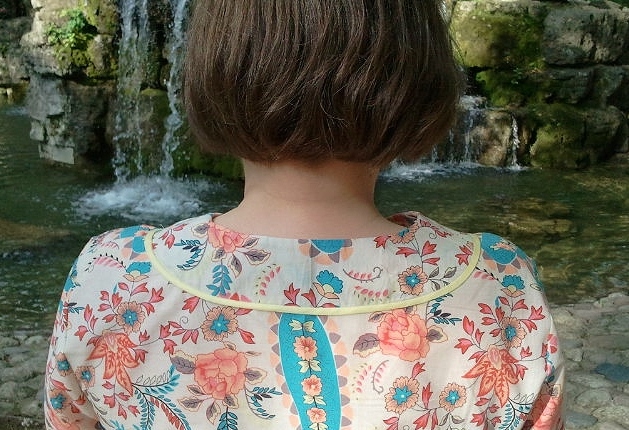 I think it worked quite well, except that I completely forgot to do the same with the back neckline. But that doesn't stand out so much -- at least, I can't see it! 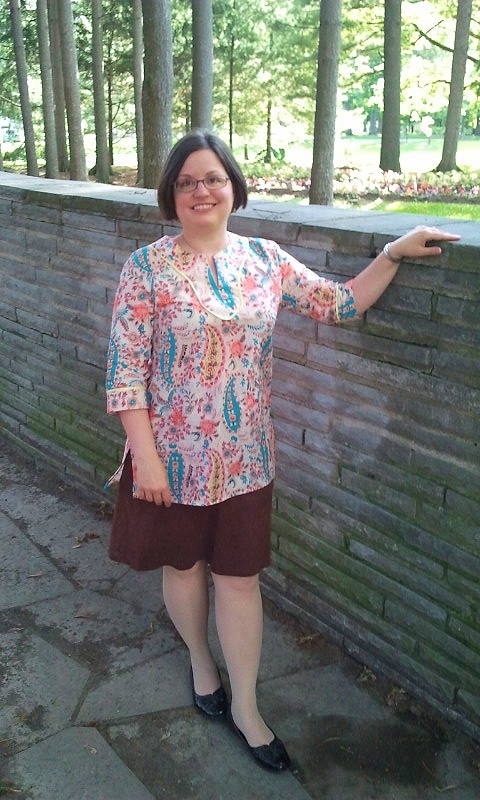 The only alteration I made was to shorten it by about an inch and 1/2 in length, and to shorten the sleeves to 3/4 length. 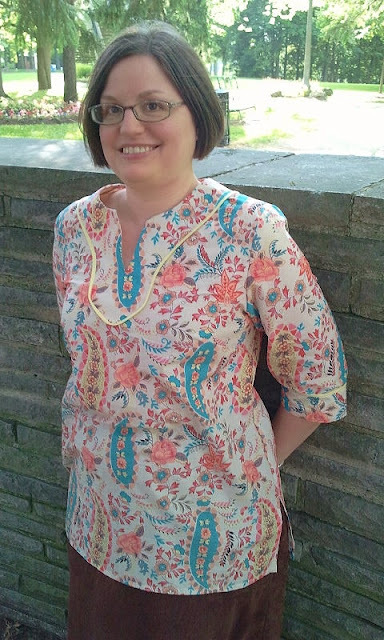 I did so because I prefer a shorter sleeve, and also because I thought with this busy print and the long line of the top, the proportions on my short self might look better with shorter sleeves.Oh yes, and I cut the bodice in medium but graded the hips out to large. I wore it today, and it is very cool and comfortable. Plus it didn't wrinkle too much -- the photos were taken after a full day of work, as we took a walk in the park on a gorgeous evening (except for the plague of mosquitoes!) 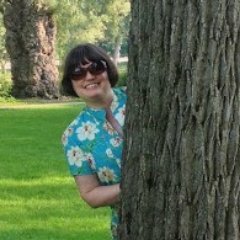 So it's some kind of mix of fibres -- enough synthetic to keep from totally wrinkling but enough cotton to make it non-stifling to wear. I am so glad I found the yellow trim. I think it really brightens it up; a good lesson to be open to inspiration even if you were thinking of something entirely else at first. 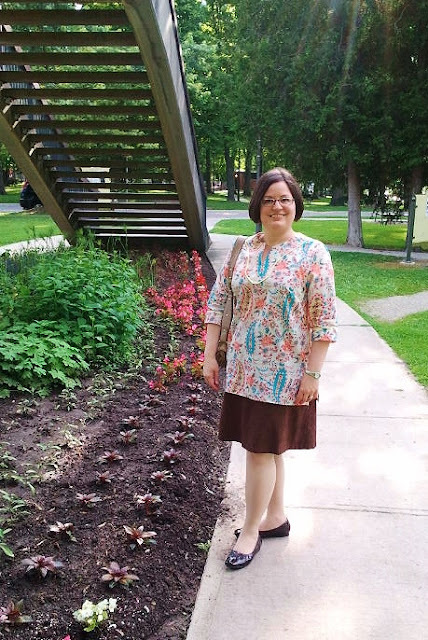 I'm happy with my cheerful summer tunic! 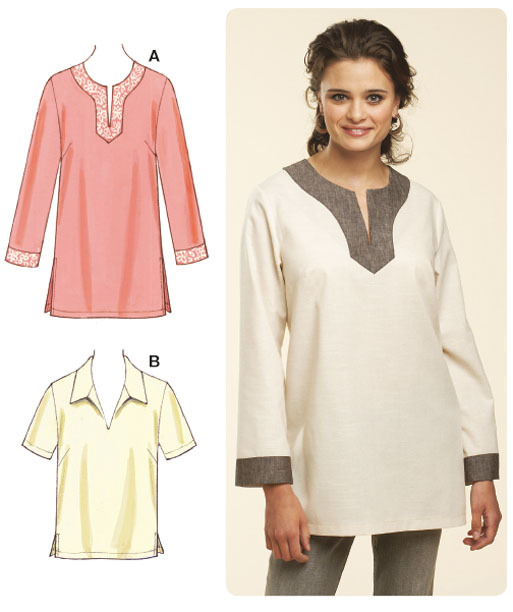 Pretty tunic and the yellow flat piping is a nice touch. Thanks! I really like the subtle contrast. Yes! The paisley caught my eye right away. Yes, very summery indeed -- nice and cool to wear. Beautiful top. What a great thrift store find! 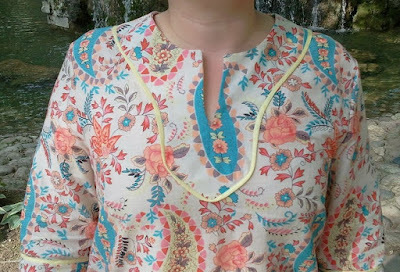 I really love the way you use piping, on this top too! Hope that your visit was less mosquito-laden!! Brilliant tunic! The fabric and piping - love! Ah, thanks! I like it more each time I wear it! Pretty tunic! Such lovely fabric. Thank you -- it is nice when fabric and pattern seem to match up so happily. Share your comments, ideas or suggestions here -- I am always interested in hearing from readers. It's nice to have a conversation! 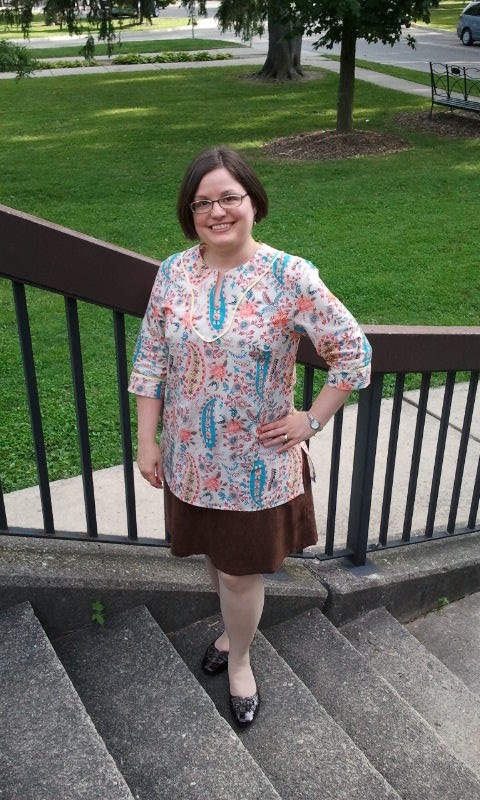 I'm a librarian and a sewist; I love stitching together both stories & clothes. 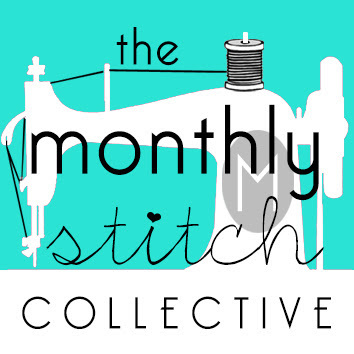 You'll probably find me reading, sewing, or embroidering... or all three together! Literary Sewing Circle: Inspired Patterns! all content c. Melanie Kindrachuk 2017. Simple theme. Powered by Blogger.